Today I have a couldn't-be-easier project for you! I've sort-of moved away from having a wreath on my front door, for whatever reason, it's just been bare for a while. So, when I saw this project, I knew exactly what I wanted to do to liven up the porch. 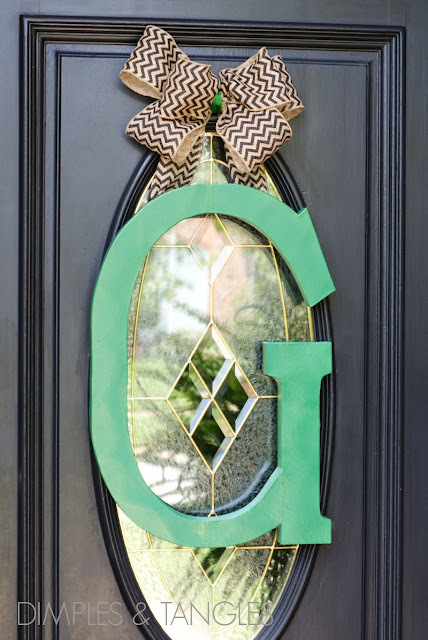 I totally copied was inspired by Mrs. Devore's monogram door hanging, chevron ribbon and all. I'm sure I've told you this before, but I just love every project that she does! Remember? I featured her amazing Cozy Coupe Cupcake Car here. I've had my eye on this burlap ribbon at Hobby Lobby for a while, and was glad to throw some in my cart for this project. They have tons of new burlap ribbon with fun designs on it, have you seen them? Lots of colors too! I wanted a large letter and didn't find an option in the size and font I wanted at Hobby Lobby, so I picked up a giant cardboard letter at JoAnn's, for about $6 with a coupon. After a quick spray paint job, I followed the tutorial at Dwellings by Devore and made a quick ribbon bow. Then, I just hot glued the tie to the back, since the letter isn't heavy at all. That's it! Now I have a little personality back on my porch, with a strong hint of what's on the inside, lots of green and black and white! Did you accomplish any quick weekend projects? Looks awesome and I'm a huge fan of both of your projects! So pretty and I love the color combination. I had a mid aisle dilemma with that same ribbon...I kept putting it in my cart, then back on the shelf. Now, I'm kicking myself for not getting it. Good thing I go up there about once a week ;) Next shopping trip! I love a quick weekend project! 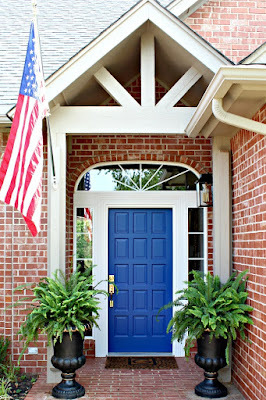 Look so fun and welcoming on your door! Love it! 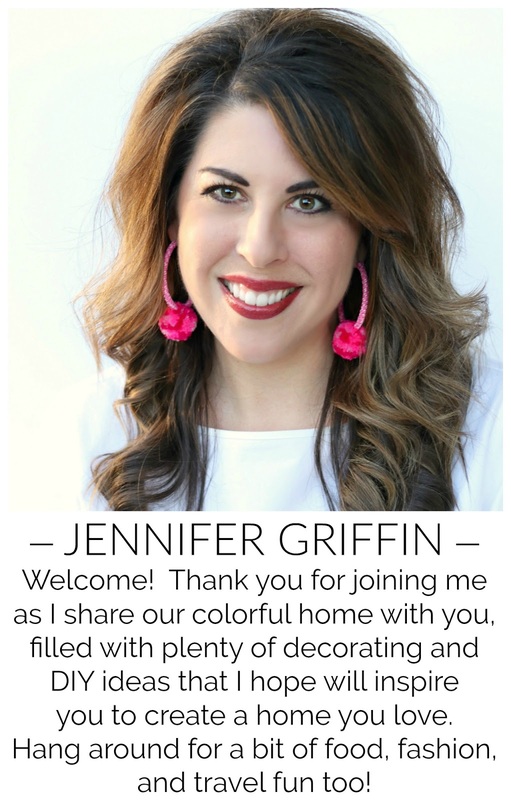 I am also loving all the new burlap ribbon that is out there. Fun! I love the scale of the letter…perfect for the front door! 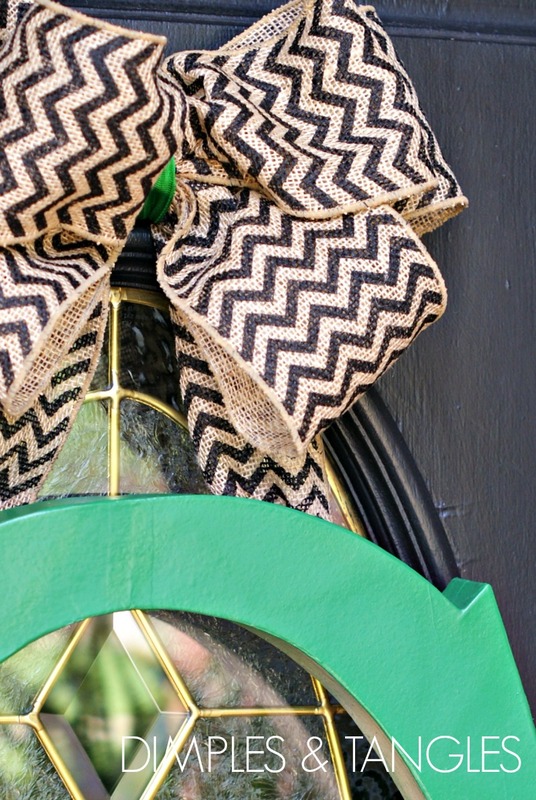 What a fun, quick and easy project to add a little zip to the front door! I've been noticing all those cute ribbon patterns, too! I love it! And it is totally inspiring me to dig out the big cardbord 'F' I have and do something similar! How gorgeous! I love it! You've inspired me! Neat! 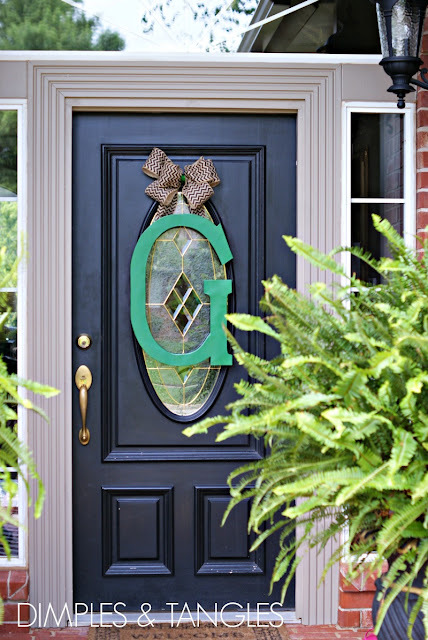 I have a monogram "somewhere" that I plan to do this with. Wanna come down & help find it in all this stuff? Really love this idea! Heading to JoAnn's and Hobby Lobby this morning.